A microphone preamp is one of the most important bits of gear you’ll have in your studio. 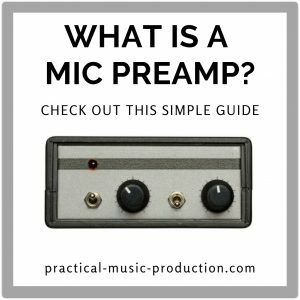 But what is a mic preamp? When you record sound with a microphone, the signal that the mic produces is too weak to be used by any of the other equipment in your studio. 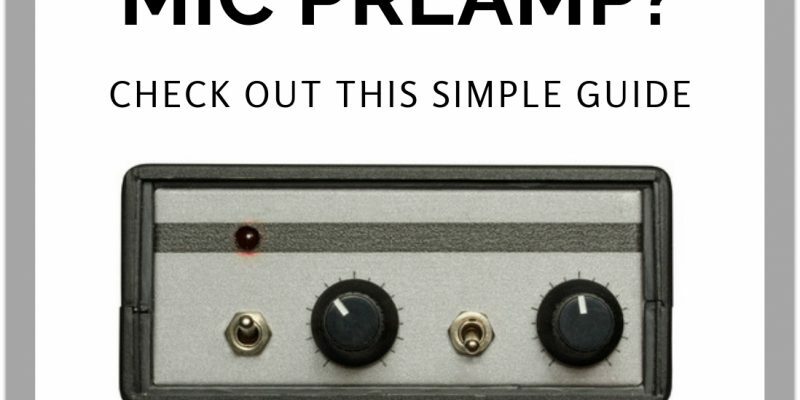 The job of the mic preamp is to take the signal from your mic and boost it to a level that can then be used by the rest of your studio equipment. This includes your studio computer and the recording software you’re using, such as Logic or Pro Tools. Without preamps, we wouldn’t be able to record anything usable from our microphones. So I think you’ll agree that they’re vitally important to what we do in our home studios. 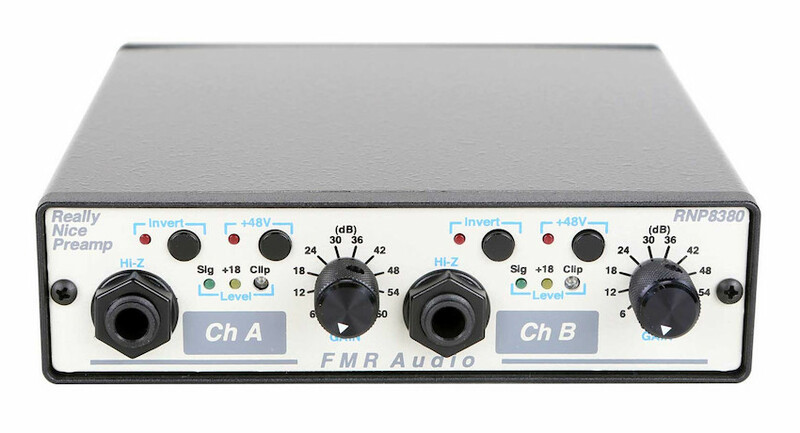 You’ll find a microphone preamp at the XLR input connection of each input channel on both analog and digital mixing desks. Audio interfaces also have mic preamps built into them for each XLR input. The preamp takes the weak microphone signal and boosts it to ‘line-level’ – a level high enough for the rest of your studio. Most preamps will boost a mic’s signal between 30-60 dB, maybe even more. The strength of the signal when speaking into a microphone can be as low as 2-4 mV. But to power a loudspeaker at the same volume can require a signal of many volts. Between the two sits the ‘line-level’ mentioned above. The two most important elementsin the studio that affect the tonal quality of your recordings are the microphone and the preamp. Every microphone you use has it’s own characteristics, and it’s the most important part in the signal chain that can affect the ‘color’ and tone of your recording. But the preamp can also have a big influence on the quality of your recordings and can also have it’s own signature feel and sound. There are two types of preamps you’ll come across – those found in audio interfaces or mixing desks, and dedicated standalone preamps (known as outboard preamps). Outboard preamps will often be higher-quality compared to those built into audio interfaces, and will commonly be used by sound engineers in professional recording studios. They can bypass the preamps found in mixing desks or audio interfaces. 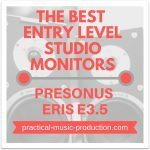 Some sound engineers and producers I know all have their favorite preamps that they use over and over again, and most of them have familiar microphone/mic preamp combinations that give them the specific tonal qualities that they’re after for a particular recording. 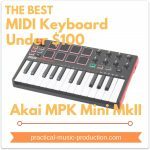 But to really notice these sorts of tonal differences you would probably need to purchase a preamp that was in the high-end range, which can be quite expensive. High-end devices like these are often referred to as ‘Class A’ tube mic preamplifiers. Valve/Vacuum Tube: these use vacuum tubes to amplify the sound coming from the microphone. They’re also found in some models of guitar amps. These amplifiers are also popular for audiophiles who say that valve amplifiers produce a warmer and more natural sound – this makes them very popular for recording vocals. They’re also much more expensive than solid-state models. Solid-state: these use transistors to amplify the sound coming from the microphone. This technology started in the late 1950s and the early 1960s. A cheaper way of manufacturing preamps, especially for the consumer and semi-professional market. Every sound engineer will have their own favourite type of preamp, just like how they’ll have their favorite mic/mic preamp combo that they use in the studio. It’s rare to find two engineers who have the same tastes in their recording chain. One of the key issues with any piece of studio equipment is if it’s overloaded, and this includes a mic preamp. When something is overloaded, it means the signal entering the device is too high and the electronic circuitry cannot deal with it. One of the biggest differences between the two designs – valve and solid-state – is how each one reacts and behaves when it is overloaded. When a tube is slightly overloaded, the effects can be quite pleasant – think of an overdriven guitar sound. Small amounts of overload can lead to a pleasant and warm distortion. But when solid-state circuitry is overloaded, even slightly, it can produce a much harsher sound that is more unpleasant to our ears. It sounds far closer to digital clipping, and it can sound harsh and unnatural. This kind of overloading can easily ruin a recording – once the overloaded signal has been recorded then it’s virtually impossible to remove afterwards. You would have to re-record your take. You’ll normally find these features on mixing desks and some top-end audio interfaces as well. Analog mixing desks will have a mic preamp on every input channel. Mic preamps are generally pretty expensive to make, especially high-quality ones. One of the many reasons why large mixing desks are so expensive is because of all of the preamps – if you have a 24-channel desk then that’s 24 preamps. And 24 channels is a small mixing desk for a professional studio! Outboard mic preamps are a fantastic way for your home studio to get super-high quality recordings. Especially without having to spend large amounts of money for a mixing desk that probably wouldn’t even physically fit into your home studio. It’s also quite common to only record one mic input at a time, maybe two if you’re recording a singer-songwriter for example (voice and acoustic guitar). So a mono or stereo preamp is perfect. One way of getting around the high cost of a mixing desk with inbuilt preamps is to look into a channel strip. These are often made by the same manufacturers as those that make desks – the likes of AMS Neve, Focusrite, and Mackie all make channel strips. So if you can’t afford the whole desk, you may be able to get ahold of one channel. 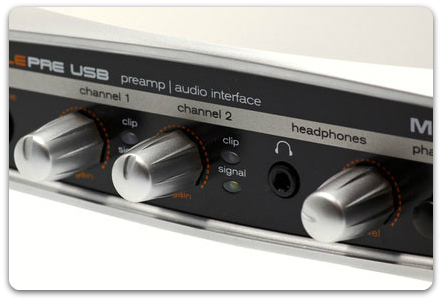 A channel strip will include a high-quality mic preamp at the input stage. But it will then include more features, the type of features you see on one of these mixing desks. Most home studio audio interfaces these days will have superb mic preamps already built into them. For example, the Focusrite Scarlett 2i2 also uses Focusrite preamps, known for their fantastic quality. But if you’re looking into picking up a dedicated outboard mic preamp for that extra boost, there are some fine models to choose from. And of course, there’s a wide range of prices as well. I highly recommend the ART Tube MP Studio V3 if you’re looking to take your first steps into dedicated outboard mic preamps. It’s on the affordable end of the scale, but is still packed full of features and high-quality circuitry that will lead to fantastic-sounding recordings. As I’ve already mentioned, it’s probably not worth purchasing a dedicated preamp when you’re at the beginning stages of setting up your home studio. 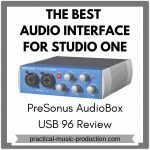 You can still get good results from the inbuilt preamps found in a mixing board or an audio interface. 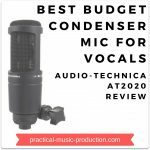 But if you have some extra money handy and you’d like to further improve the quality of your recordings, then it won’t do you any harm to look into the possibilities that a microphone preamp can bring. A good preamp can bring great leaps in the quality of your recordings.